So the match that many Tottenham fans wanted both teams to lose ended with yet more silverware for our pesky North London neighbours. With all bias placed in the bin, you have to bow the knee to Arsene Wenger for his extraordinary FA Cup record. I don�t have to remind you that he has picked up the treasured FA Cup a record seven times, while what was once Tottenham�s favourite trophy has not been won once by the Lilywhites. That 1991 victory over Nottingham Forest in the days of Terry Venables seems in the dim and distant past. 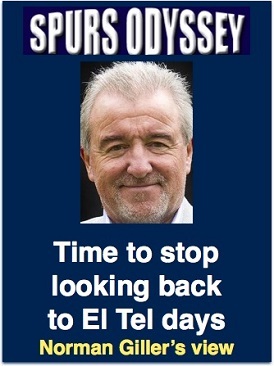 It really is time Tottenham stopped having to look over their shoulders at El Tel�s victory as the last FA Cup triumph. There is a generation of Tottenham fans growing up who were not even alive then, and they hear us old �uns talking of Wembley glory as if it was from a previous century. Oh, hold on, it was! Fact: Runners-up Tottenham have just had their greatest season since the launch of the Premier League 26 years ago, with nothing but pride to show for it. Fact: Fifth-placed Arsenal had one of their worst seasons � and still finished with one of the major trophies in their cabinet. Bragging rights have become thin on the ground, and as our old Lane home is reduced to rubble let us hope that Spurs can build for a new future in which they quickly end the long silverware famine. Mauricio Pochettino is creating a new dynasty in an era of great expectations, but everything will remain shrouded in disappointment and underachievement until we land a trophy. Monsieur Wenger � a true professor of football � has again had the last laugh, and if I were in his stylish French shoes I would now walk away from the Emirates with two fingers in the direction of his many critics. But I think his ego is pulling him towards staying in his job, aggravating as many Gooners as it will please. Those who blindly elected to miss the FA Cup final because they detest both teams missed a wonderful game of football that was a joy to watch for those with neutral eyes. I cannot understand how people can be authoritative and knowledgable with their opinions if they do not watch the matches that matter. The major talking point from the final is the urgent need for the introduction of the video ref. Arsenal�s first goal would probably have been disallowed if a third man had been allowed to judge it on action replays. I don�t like the invasion of technology, but the only thing that really matters is getting it right. Tottenham�s targets next season include the biggest prize of them all, the Champions League. Every game is going to be like a cup final, with Wembley as the home stage. Spurs have to overcome what could become a Wembley complex by proving they can feel as at home there as at the old Lane (it is heartbreaking to be talking about the Lane of Dreams in the past tense). The problem with playing every home match at the national stadium is that visiting teams get the adrenalin boost of thinking they are taking part in a cup final and raise their game. Solution: we have to raise our game even higher. We can look forward to some cracking games while waiting for the unveiling of the new Lane. Nuisance alert: I have now counted 27 players Tottenham have been linked with as possible summer targets. Ignore every one of the stories from the know-nowt ITKs until you see them in the club shirt and with Mauricio beaming alongside. On the exit stories, I hear from good contacts that there is anxiety over the futures of full-back partners Kyle Walker and Danny Rose. We shall see. Now then, how to fill the next football-free weeks until the dawn of the new season? 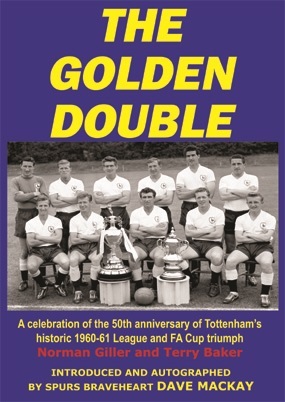 Each Monday here on my Spurs Odyssey stage I shall serialise the Golden Double book I wrote in harness with Terry Baker � spotlighting the greatest season in Tottenham history: The Double Year of 1961. Last week I asked: Who made the final pass from which Ricky Villa set off on his dribbling run to score the �Wembley goal of the century� in the 1981 FA Cup final replay against Manchester City? The answer was, of course, Tony Galvin, the silky-smooth winger who could famously speak Russian. It was his pass that set Ricky Villa off on that tango run that tangled the Man City defence and led to his incredible winning goal. First name drawn from the correct answers was Peter Friend, a Spurs fan for 40 years who used to live in Hendon but now remains an avid fan while exiled in Spain. I will send Peter a screen version of my Spurs �67 book (you might consider buying a signed copy from me at http://www.normangillerbooks.com � all profits to the Tottenham Tribute Trust to help our old heroes). This week�s teaser: Who came off the bench to score a hat-trick against Bruce Grobbelaar to lift Spurs to victory after they had gone 2-0 down in an away FA Cup tie replay? Email your answer please to SOQLTeaser3@normangillerbooks.com. Closing date: midnight this Friday. I will send a screen version of Spurs �67 to the first name drawn from the correct answers.